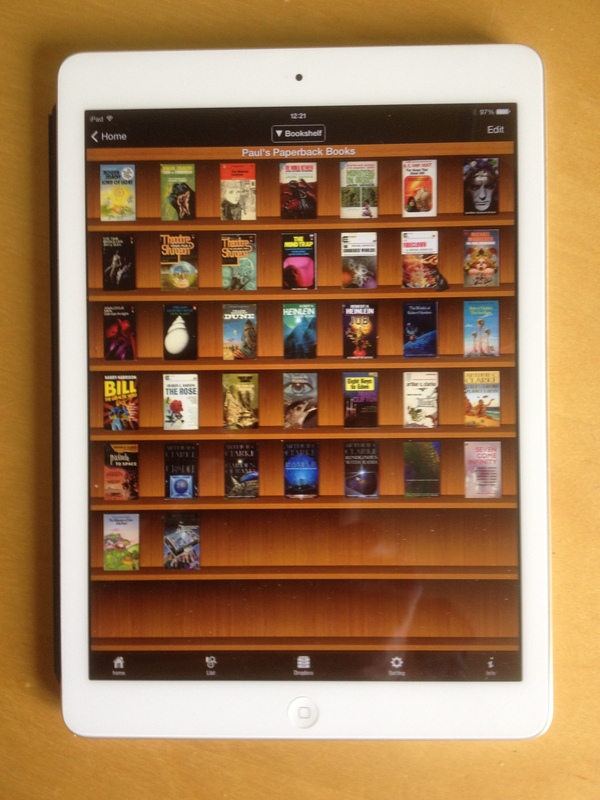 Although I’ve decided to start this work by initially displaying my digitised books in the Sidebooks iPad app, I still want to have the possibility of exploring interaction with a full size simulation of a shelf full of books. 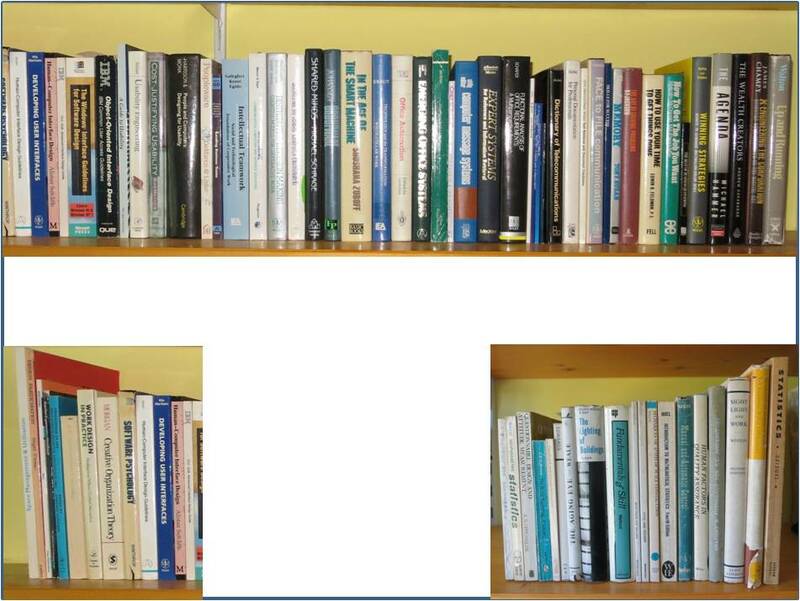 So, before starting to scan, I took some photos of the books on the shelves and manipulated them using the GIMP editor to get them to come out actual size on two 30 x 40 in Poster Prints which I got using a half price offer from the Snapfish service. That gives me the ability downstream to cut out each set of books from the posters and fix them to whatever surface I desire. Covers: The covers need a separate flatbed scan so I do them first to a separate file and stitch them into the main PDF at the end of the process. Page browning: Older paperbacks seem particularly prone to this and can result in scanned images that are too dark. To get a readable scan the contrast setting needs to be adjusted. Pages stuck together: Pages need to be completely separate from each other to go through the scanner smoothly, so the spine cut has to be sufficiently far in to ensure that none of the pages remain stuck together with the spine glue. Spine cut can skew: I’ve found that trying to cut through too many pages at once is counterproductive as the cut gets skewed. So I limit the edge cuts to sections of about 130 pages. Incorrectly scanned pages: The pages go through the duplex scanner very quickly (a couple of minutes for 150 pages) and occasionally the software makes mistakes such as cutting off the edges of pages, or displaying two or more pages as a single image, or failing to turn a page to its correct vertical alignment. So I conduct an eyeball check of the thumbnails as the pages go through the scanner and rescan if there appears to be major problems with a particular run; and then I do a detailed check in the PDF Editor afterwards before inserting the covers and creating the Bookmarks (see below). Bookmarks: The Sidebooks software has a facility to display a book’s contents which can be used to jump to a particular part of the book – but these are essentially bookmarks which have to be manually created in the PDF version by going to each relevant page, specifying the destination point and creating the text that will appear in the bookmark list. The more chapters or sections that a book has the longer this process takes – I’m beginning to value authors who don’t go overboard on the chapter thing. Testing in Sidebooks: The final stage is to place the finished file into my dropbox folder on my PC, wait for it to replicate, then to open the dropbox option in Sidebooks, select the file and wait for the book cover to appear on the Sidebooks bookshelf. This is an incredibly quick process – it takes about 40 seconds from start to finish for a 15Mb file! I then do a quick check of the covers and a few pages to make sure they look OK and then test that each of the bookmarks links to the correct page. Sometimes, the wrong page is opened or I discover a spelling error in the Bookmark text so I go back to the PDF editor and make whatever changes are required and download the file again. Proof of ownership: To demonstrate that I haven’t just ripped these books and to insure against any copyright issues downstream, I am pulling the complete front, spine and back covers intact from the spines of the books themselves and retaining them together with the Title and Publisher’s Info pages, and storing them in the loft (the intact covers may also come in useful if I want to create images of the spines for any interaction experiment downstream). My initial reaction to the results in Sidebooks (see below) is very positive. 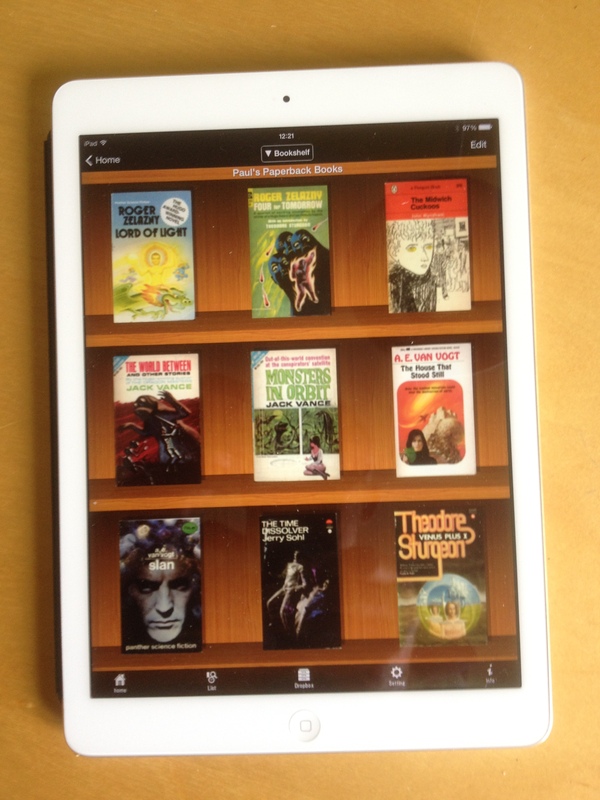 It may just look like a familiar old e-book display – but the fact that they are all my books that I’m familiar with and that they are so easily accessible is particularly satisfying. When I’m through the scanning process I shall do a more detailed examination of the impact of this different way of owning a collection of books. 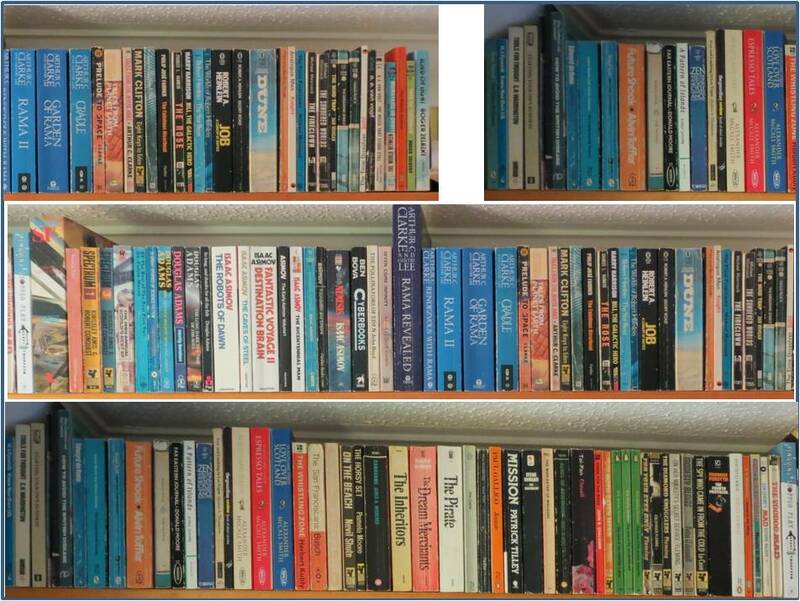 Above are three views of the Sidebooks bookshelf showing the 35 paperbacks I’ve scanned so far. 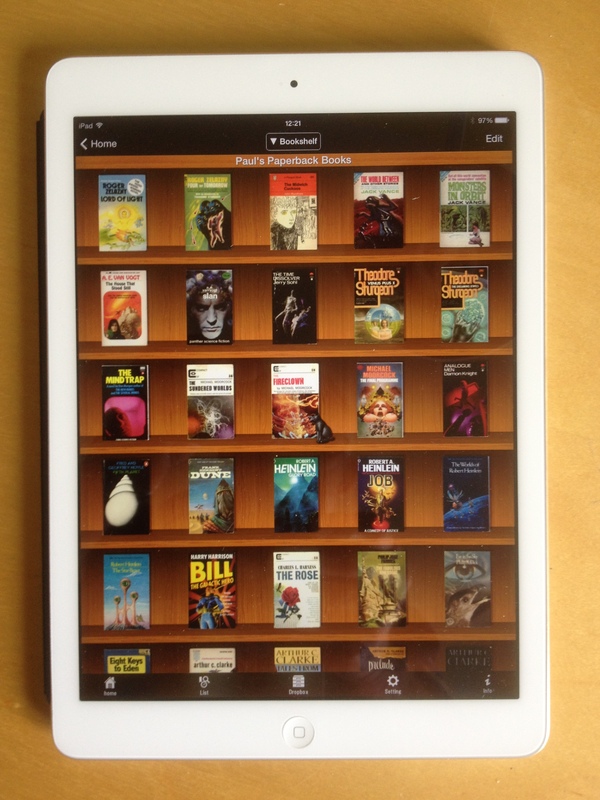 Sidebooks reacts to the iPad zoom in and zoom out facility by placing more or less books on a shelf.